This evening I spent a little time at a friend’s house, looking in on her cat. As an aside here, cats are great! In amidst the playing with the cat, the radio was on. The radio was on when I got there and I left it on when I left (as instructed). After playing with the cat for a while, I sat down on the couch and listened to the radio for a little bit. While usually not an experience worth noting, this one was. NPR was playing and because it was the weekend, it wasn’t the usual NPR-programming I was used to hearing during the week when I have NPR on in the car. In fact, listening the radio inside the house is an altogether different experience than listening to NPR in the car. In fact, outside of this evening, I can’t remember the last time I listened to the radio inside the house (and wasn’t doing something else at simultaneously). Anyway, NPR was talking to bright young musicians. When I say young, these folks were still in high school, but they had some incredible stories. The thing I want to point out: I was forced to imagine the conversation between the host and the guest… and imagine the audience, too (as they were in front of an audience). This is something that I rarely have to do (because I don’t listen to the radio unless I’m in the car). 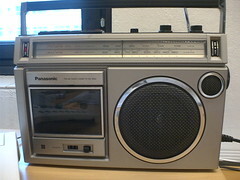 1) It made listening the radio a much richer experience. That is, I was forced to use my imagination to fill in the holes as to the facial reactions by the guest and the host and fill in the space of what the audience might be doing, too. As I said, this is something I don’t have to do very often. 2) It made me think about what it might have been like for people before there was TV. Huddling around the radio together used to be a common family activity. It’d be hard to conduct this study, but I wonder what the data would show based on those folks who had to do more imagining (before there was TV) vs. those folks who don’t have to do imagining (because there is TV). I wonder if the “before there was TV” group might have more developed imaginations. This entry was posted in Entertainment, History and tagged Cat, Imagination, NPR, Public Radio, Radio, TV. Bookmark the permalink.